But it says the best is yet to come. After a pretty rough month, BioWare GM Casey Hudson has written an Anthem post-launch update, acknowledging some of the shooter's issues but putting on a brave face when it comes to the game's future. BioWare's actually been pretty communicative since launch, even if it doesn't always have good news, and Hudson's analysis of the launch seems sincere, even though it understates some of the problems. "We launched a game that so many of you tell us is really fun at its core, but we also had a degree of issues that did not reveal themselves until we were operating at the scale of millions of players," Hudson says. "We were of course very disappointed about that, as were many of you." A lot of trouble Anthem had at launch will be familiar to anyone who has played a new online game, but as Steven noted in his Anthem review, it's also full of fundamental issues that would exist whether a million people were playing or one. Some of these problems, Hudson points out, have already been addressed. One of the biggest complaints, the dearth of endgame loot drops, was finally tackled last week, for instance. He also promises more world events, story and new features that will culminate into the upcoming Cataclysm event in May. Earlier this month, Samuel wrote that old BioWare had become a distant memory, and the closing paragraph of Hudson's update, where he says "with everything we do, we focus on staying true to our mission, creating worlds that inspire you to become the hero of your own story" got me thinking about the article again. Anthem just doesn't feel like a BioWare game, and if that still is the developer's mission, it seems to have failed. 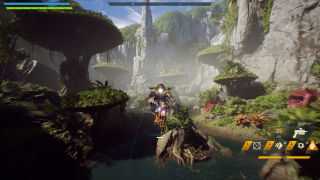 Apparently, the best parts of Anthem are yet to come, but it will take a lot of convincing to get people to believe it.